Happy Friday everyone! Rogue Brewing typically isn’t on my radar as I find most of what they produce to be solid beer that fits very well into its specific style. They tend to be well made examples of each category but tend not to press the envelope much. Which I must admit has been very good to them as they’ve even started their own barley farm. 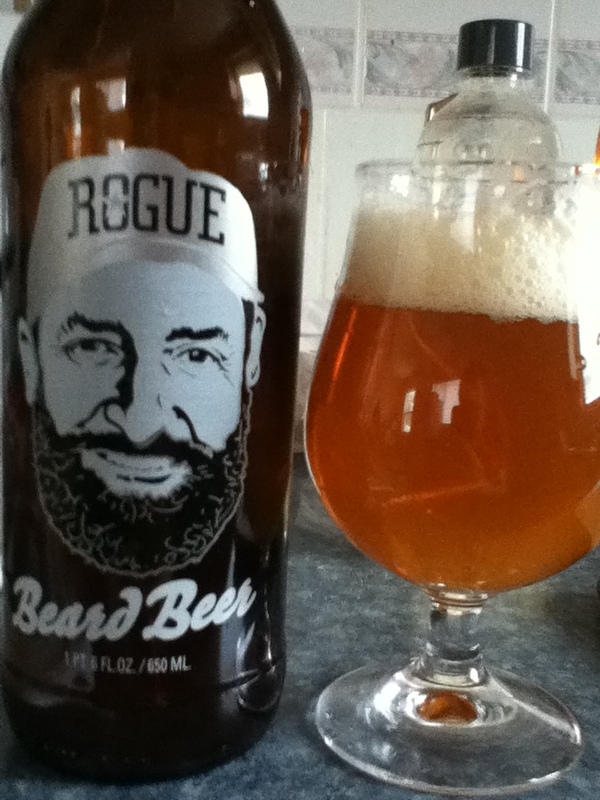 But I’m not here to talk about Rogue Brewing the company I’m here to talk about a brew from them called Beard Beer. Beard Beer is an aptly named brew that sources its yeast from the beard of its brewmaster John Maier. Now before you get all freaky on me there are many worse places to source yeast and John has been a brewer for decades and his beard contains many different varieties of yeast some of them may not even be available any more. But much like the brettanomyces collected from the night air in ancient days we have no idea where the yeast originated in our beer I think knowing that it came from a beard is actually kind of comforting. At any rate Beard Beer is a nice lighter ale not too malty and not too hoppy(25 IBU) as to push the flavour of the yeast to the forefront. Now I would like to take a minute and talk about yeast. Sours are becoming more popular now and while loads of people love a good hoppy beer yeast is a newer flavour for most beer drinkers. Those more familiar with Belgian beer varieties are already familiar with some of the more interesting tones yeast can set. Beard Beer is one of those beers that specializes in allowing the drinker to taste how yeast can affect the character of beer and it does an excellent job. I’m not sure that John’s beard yeast would be considered brettanomyces(wild yeast) or not, as it tastes very Belgian to me, but it renders some absolutely wonderful flavours to a brew. Hardly any sour notes, loads of fruit and a softly lingering finish that is slightly bitter. This profile is very similar to other Belgian style brews I’ve tasted, hence the comparison, but it differentiates itself enough to become something completely unique. I really enjoyed it and I think any person that is newer to craft beer could really gain a lot of palate knowledge by trying Beard Beer. I highly recommend this beer. Cheers! WCBL.